Multi-hand blackjack is an increasingly popular format of 21, widely available at the best online casinos. It differs from traditional blackjack games by allowing us to play up to five independent hands at the same time. If you are a true gambling multi-tasker, these games are the way to go; and if one hand of BJ is entertaining, then it makes sense that five hands would be five times more entertaining. 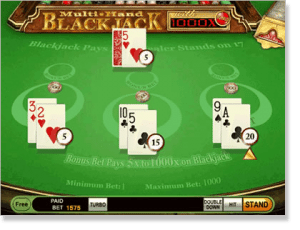 Because of this style of play’s popularity among web-based blackjack players, the majority of games offer both a multi-hand and traditional single hand version. Note: This page is intended for our international readers only. Online casinos have been banned from offering their services in Australia as of September 2017 following the introduction of the Interactive Gambling Amendment Bill 2016, so for Australians the content on this page is informational in nature only. 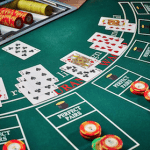 Australian’s can learn about the blackjack options available at land based casinos using other articles across our site like Crown Casino Blackjack and Star Sydney Blackjack. The objective and rules of multi-hand blackjack are essentially the same as regular blackjack rules. We have to beat the dealer by acquiring a hand that is as close as possible to 21 without busting. All cards hold the same value as normal, i.e. face cards are worth 10, Aces can be counted as either one or 11, and all other cards are worth their own value. Before we play online, we need to decide how many hands of blackjack we want to play. As every virtual game has five seats at the blackjack table, we can choose to have up to five hands played when we are playing by ourselves. When placing bets across however many hand we choose to play, the bets do not need to be alike in total for every hand. And evidently, during each turn, we have the flexibility to increase our wagers on stronger hands and remain conservative on others. If the multi-hand game we are playing incorporates optional side bets such as Lucky Ladies and Perfect Pairs, we can place different sized side bet amounts for each of our hands. The game proceeds as normal, and we play out each of our hands independently from one another, and in turn from right to left. Once finished, the dealer plays their hand and continues as normal, according to the rules of the blackjack variation being played. As in every other game of 21, optimal blackjack strategy will hold you in good stead for the most part. This is especially important when we are playing several hands at once, where money can go fairly quickly if we play too impulsively. We do have the flexibility to try different moves across different hands, playing more aggressively when doubling and spitting, or visa versa, to see how the different outcomes play out. It may be in your best interest to test out some differing strategies when playing soft hands, for instance. Try being more aggressive with some, but conservative with others. Always try to make sure you have enough chips for hands which lend themselves to splits and doubles, and keep your bets for however many hands you play, to a level you are comfortable with. Many land-based casinos will allow one player to play across multiple hands on a blackjack table, but only if the table is relatively, if not entirely, empty. If we take into account multiple players and limited table space, the ability to play several hands at once is not practical. Some b&m casinos will also employ a rule, where if playing more than one hand at a time, you will need to bet more than the minimum amount for any additional hands played; the reason being that casinos don’t exactly want a minimum bet gambler taking up two spaces, possibly preventive others from betting more. Internet multi-hand blackjack however, grants us the ability to play at our own pace and take our time with each move, without restricting others from getting on with their games. And there is no chance of error, as online games backed by random number generation do not allow for any mistakes. There is no real advantage or disadvantage to playing multiple hands of blackjack at once. However, it does stand to reason that the more hands played, the more likely the house edge will play out overtime, like the probabilities suggest, but that is the same with any game in the long run. It can’t be argued that multi-hand blackjack is not enjoyable, because it is. And that’s the key point, anyway. 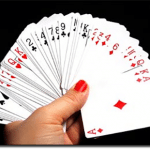 Multi-hand blackjack is a fun way to play the game of 21, especially when we are getting tired of single hand, after single hand. So good luck on the (multi) tables.